UPDATE APRIL This video has been taken down due to a copyright claim by Ron Perrillo. 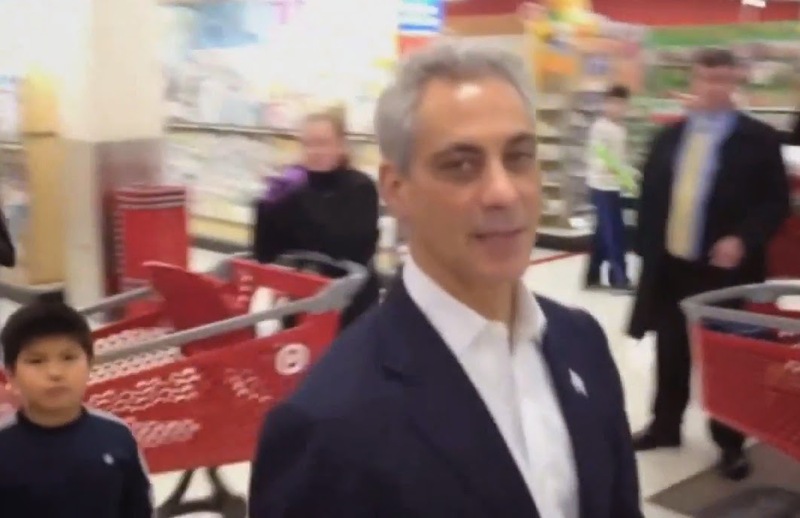 Did Chicago Mayor Rahm Emanuel really shove a man who refused to shake his hand inside a Target store recently? With a child watching from just steps away and cameras everywhere? That's the accusation of YouTube user Hechosdcolon, who posted 5 seconds of cell phone video along with his claim of being mayorally battered. As the video rolls, a small child bounces behind Emanuel and the mayor extends his hand toward the camera. Left hanging, Rahm takes his hand back and says to the camera, "get that thing out of your face there for a second." Emanuel appears to then raise his hand and make contact with the video maker as he walks by. The clip abruptly ends. Skip ahead to the 19 second mark for the footage HERE. There is no evidence that the mayor shoved other "people" away as Hechosdcolon implies in some of his word choices. We emailed Hechosdcolon Friday evening to ask questions such as if he has political affiliations and if, by chance, he had something other than a phone "in his face" at the time of Emanuel's statement. He has not yet responded. His video post history includes clips that encourage viewers to "fire" Rahm.